Selecting the right Obstetrician/Gynecologist is an important decision. Technical expertise in all areas of obstetrics and gynecology is an important starting point, to be sure. But just as important is an Ob/Gyn doctor who listens to you – someone you can talk to frankly, without embarrassment. 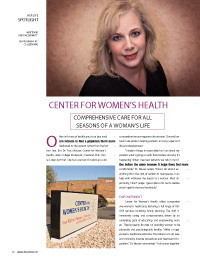 Center for Women’s Health is where women in Overland Park, Kansas City, Leawood, Prairie Village, Olathe and the surrounding metropolitan area have been receiving exceptional medical care with a personal touch for the last 40 years. You’ll be impressed with the individual care and attention you’ll receive from Traci (Hodes) Nauser, MD, and our Nurse Practitioners, Colleen O’Donnell, RN-C and Natalie Wellington, APRN-NP-C, OCN. Here women are treated as individuals, and from the beginning to the end of each visit care is managed with sincerity and compassion. Center for Women’s Health uses state-of-the-art equipment and practices in all aspects of their patients’ care, performing many procedures now in the office setting. Whether you are seeking the nurturing support of an experienced nurse practitioner, needing the skills of the area’s finest laparoscopic and minimally invasive surgeon, looking for a young empathetic female provider knowledgeable with teens for your first GYN exam, or wanting the precision of daVinci® robotic surgery, you've come to the right place. We are proud to offer ThermiVa®, Endosee®, FemVue®, Essure®, Minerva® and MyoSure®, along with so much more! Located in Overland Park, Kansas, the office is easily accessible to residents of both Kansas and Missouri. The office is just off Interstate 435 at the Roe Avenue exit. You can feel confident that your privacy will be protected when visiting the office. The Center for Women’s Health is located in our own building on totally private property. You’ll feel comfortable with the casual, relaxed atmosphere you’ll encounter at the office. There’s plenty of time for the attention you deserve. INFORMATIONAL MATERIALS are available in printed form and online at womansrighttoknow.org and kansaswomansrighttoknow.org, describing the unborn child and listing agencies which offer alternatives to abortion with a special section listing adoption services, and a list providers of free ultrasound services.